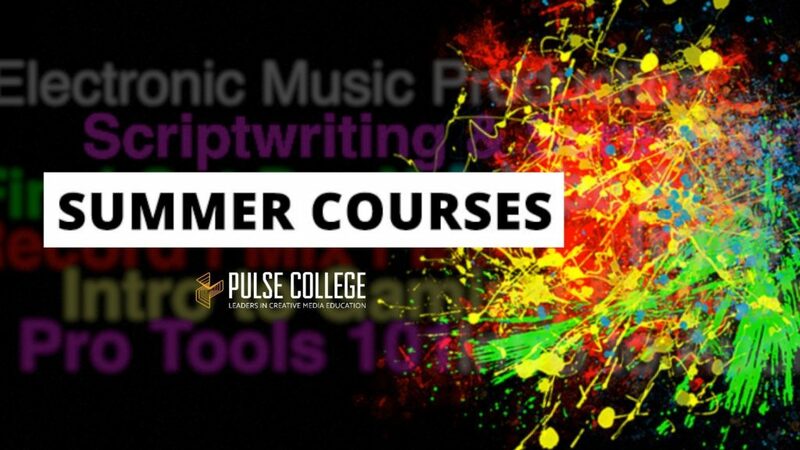 Make more of your summer and don’t miss the chance to sign up for one of our short Summer Courses here at pulse college. If you’re interested in Audio, Film, Games or Animation – you’ll want to know about a range of short introduction courses we’re running in the coming months. Places are filling up fast so, apply now and reserve your seat! Here’s a look at what’s on offer….. So whether you’re interested in an introduction to audio, mad about electronic music production, want to brush up on your mixing skills or go to whole hog and spend 6 days in Windmill Lane Recording Studios covering every aspect of the recording process in a high-end studio – we’ve got you covered! The Intro to Film Production Summer Course will give students and excellent knowledge on using the latest recording equipment and the whole process that goes into producing a film. You’ll gain experience in writing, filming, directing and editing. For any budding writers out there, we’ve created a short Scriptwriting and Screenwriting Course. Learn from the pros on how to take a basic idea and craft it into a finished script ready for shooting. We’ve also developed two courses aimed at post production….Adobe After Effects and Final Cut Pro X – two of the leading software packages on the planet. Final Cut Pro is a very powerful package for doing all your video edits and Adobe After Effects creates all those awesome special effects you see on the big screen. Learn More about Adobe After Effects. On the Intro Course you’ll spend 6 days learning the skills needed to create a your own first person game covering key areas including: game development and programming, design, art, audio and sculpting. On the short programming course students will create a different genre of game each day under the guidance of a industry expert. Both courses give students excellent new skills and an insight into the animation industry. We’re here to help so, once you’ve had a look through the summer courses and picked a couple you’re interested in please feel free to contact us. We can talk you through the course and guide you in the right direction – to the perfect course for you! This entry was posted in Animation, Audio Engineering, blog, Film Production, Games Development. Bookmark the permalink.